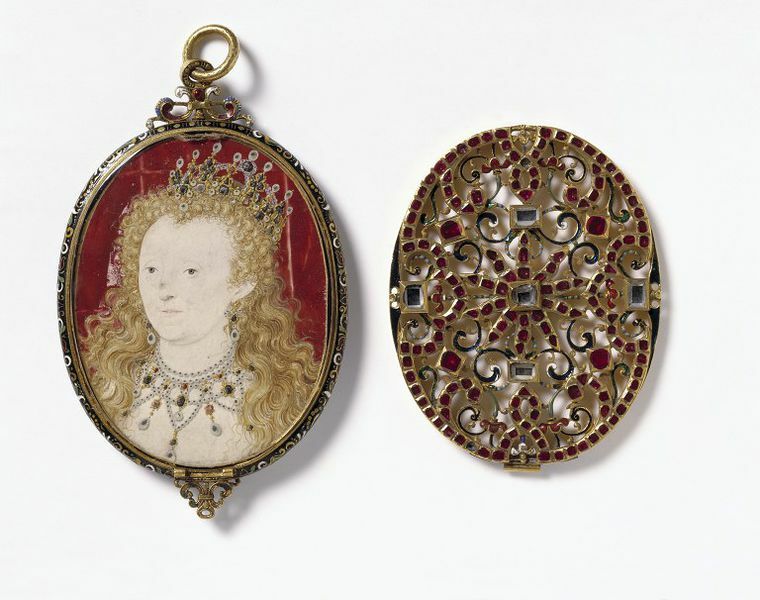 From the late 1580s there was a proliferation of portraits of Elizabeth I. In this period, the political and religious temperature of Europe rose and there were many threats to the Queen's safety, especially from Spain. It therefore became fashionable to express loyalty and devotion to the Queen by wearing her image. The original jewelled and enamelled case in which this miniature is set demonstrates the expense to which some would go to house her image. Elizabeth I rarely sat for portraits, so one sitting provided a 'pattern' that was then repeated in various forms. This face pattern is by Nicholas Hilliard and is often called the 'Mask of Youth'. The Queen was then 60, but the artist reduced her features to a few simple lines, so rejuvenating her appearance. In this version Elizabeth wears her hair long and unbound, as unmarried girls did, to signify her virginity. This gives pictorial expression to her claim to be a Virgin Queen wedded to her kingdom. The locket is an example of how the former Roman Catholic practice of wearing holy images became transferred to images of Elizabeth. It reflects the near-cult that grew up around her, with the devotion once given to the Virgin Mary in Catholic countries, but no longer possible in Protestant England, finding an outlet in the homage done to the Queen. Portrait of Elizabeth I contained in a gold enamelled case set with diamond and ruby. 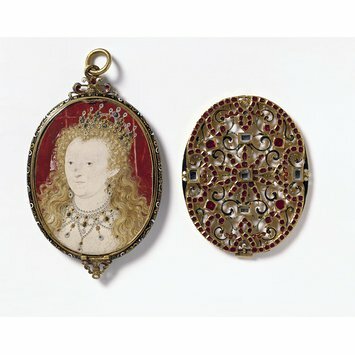 Portrait miniature of Elizabeth I by Nicholas Hilliard in a case of enamelled gold set with a diamond and ruby, England, ca.1600. 100 Great Paintings in The Victoria & Albert Museum. London: V&A, 1985. 220 p. : col. ill., p. 42. Nicholas Hilliard trained as a goldsmith and developed painting techniques that exploited this training. He used metallic pigments to mimic the jewellery on the opulent clothes that were fashionable. Hilliard created the image of Elizabeth and her courtiers that we know today, but he never won a salaried position at court. He had to set up shop in the City of London. From there he painted anyone who could afford his services.